Summary: An easy final day, crossing the last pass and then downhill all the way back to the starting point of our circuit, Chonggu Si monastery. My night in the filthy hut almost killed me. Not because of the cold or the smoke and carbon monoxide from the fire, but a falling wooden beam that almost brained me. After worrying throughout the trip about coming a cropper slipping down steep mountainsides or being swept away in torrential rain-flooded rivers, my only brush with danger was when I was narrowly missed by a heavy wooden supporting beam in the shed that Yue Qiang knocked over while cooking. It weighed a ton and slammed down right next to me - and no doubt would have caved my head in if it had been one foot closer. It was all over in a second and weirdly after a couple of moments of delayed shock, I didn't give a toss. It had happened - I'd had a very near miss and that was it. Nothing more I could do about it! 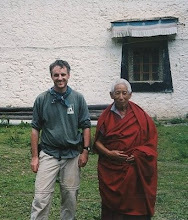 I emerged from the hut on Tuesday morning, exactly one week from the day we had set off from Chonggu monastery. We were just below the final pass, which we could see was festooned with prayer flags even from our starting point lower down. The weather had cleared up a bit - the rain had stopped, but we were still surrounded by rising mist as we packed up our bags outside the hut. Birds were singing in the surrounding bush and I recognised the calls of what to my Australian-attuned ears were 'European' species - blackbirds, wrens and thrushes. I felt a twinge of homesickness for England at these birdsongs from my youth, but it also felt a bit out of place hearing the sound of birds in Tibetan mountains that I associated with English country gardens. The porters arrived and rounded up the mules from the surrounding hillside. They put saddle packs on them and fed them with the leftover momo bread that they had cooked up. While they were packing up, I did a final Video Diary for the film crew. 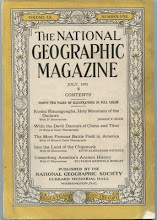 They tried to make me say that this was the end of an era and that I had finally completed my epic quest to walk all the expeditions in the footsteps of Joseph Rock. This wasn't really true because I'd had that satisfaction when I completed the KawaKarpo Kora in 2014. If I was being honest, this trip was just a repeat, for fun. I'd already 'done' Yading in 2010. At 9am, after ensuring we had our rain ponchos handy, we set off up the hill for the final pass. 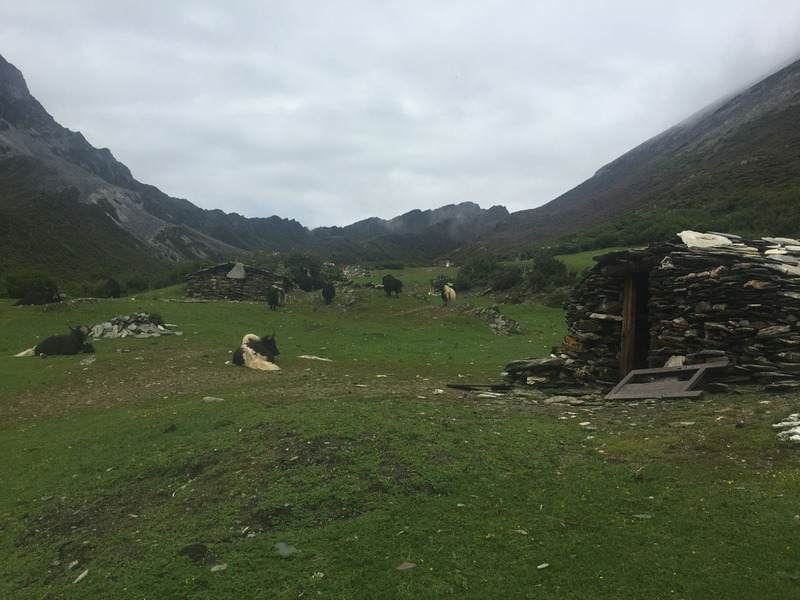 I followed the lead of Gong Que, who as usual took his own idiosyncratic 'off piste' route round the side of a heather-festooned outcrop that took us into a No-Man's Land way off from the track. 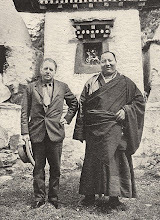 Gong Que had a funny but sometimes anarchic Tibetan sense of impulsiveness. He would dart off here and there for no obvious reason other than to explore a side track or photograph some flowers. Sometimes this would yield unexpected rewards, but all too often it just led to dead ends and us getting stuck. 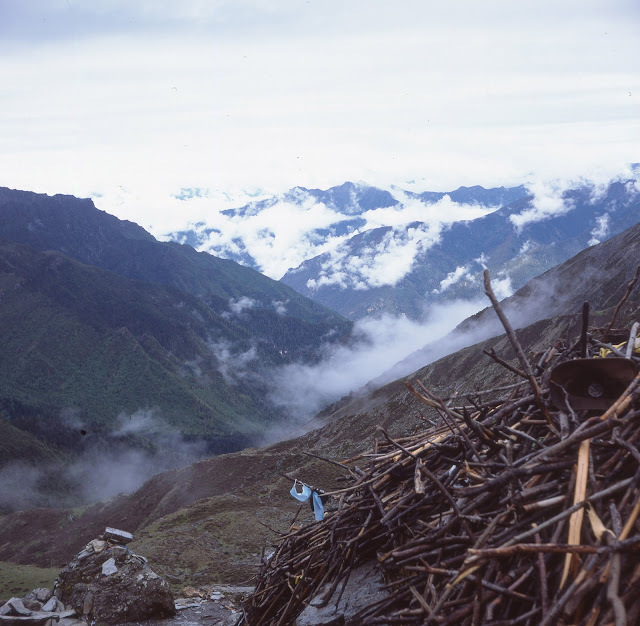 He was supposed to be my guide but he was not local - he was from Kangding - and it was usually me pointing the correct route to him, not the other way round. Gong Que reminded me a bit of the hapless Stunt Man character from the Fast Show: "You want me to walk over this steep drop without a safety harness? Righto chief!" It took us only an hour of climbing to reach the final pass, from where we had a great view back over the "Here Be Mud'" territory that we had squelched up the previous day. 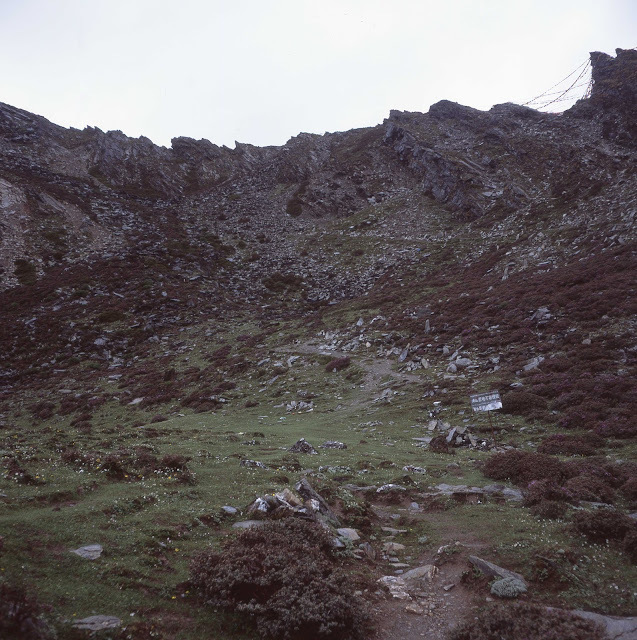 There was a sign near the top warning pilgrims not to dump clothes or trinkets at the pass - and yet it had been ignored and the passage over the ridge was still festooned with flags and old shoes and beads. Over the other side of the pass we could see the route descending down a green valley all the way to the forests above Chonggu Si. 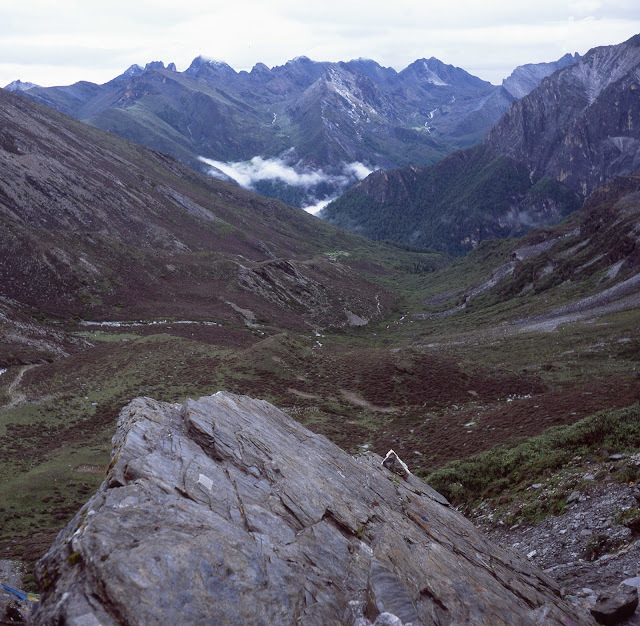 And thus I set off on the final stretch of kora - the descent to Chonggu Si. It was a fairly easy route and the rain held off for most of the morning as I tramped down stream beds and over well-worn tracks in pasture. I was mostly walking alone as we had split up into separate groups to walk at our own pace. Gong Que was away in front somewhere, I was in the middle and the sickly film crew guys were lingering behind with the horses they had ridden for much of the kora. It was a long plod down to the tree line, and there wasn't much to see on the way, except occasional glances back to the pass. We passed a couple of stone huts about half way down and then entered thicker bush that eventually morphed into the fir forest. It was here I had my second near miss of the trip, when I narrowly missed having my eye poked out by a protruding sharp broken tree branch. 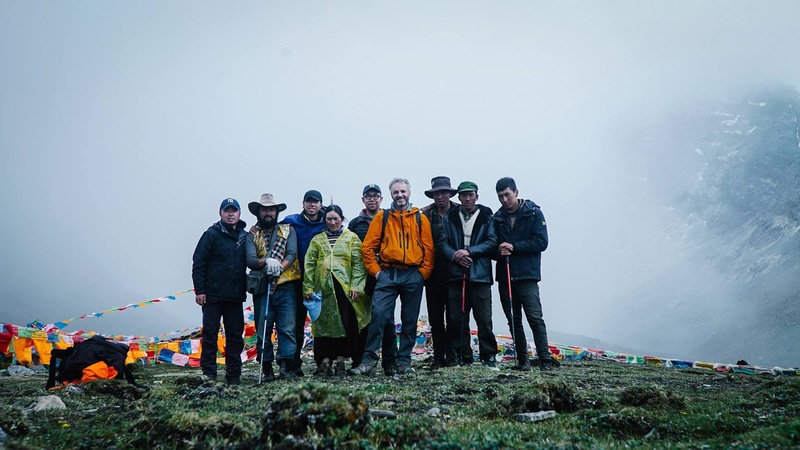 The final hour or so through the forest seemed the longest, and I experienced a strange mixture of relief and sadness when I finally spied the big flag-strewn stupa that marked the tourist boardwalk lookout point at Zhuoma Tso lake above Chonggu monastery. I walked the last 100 metres in a bit of a daze, feeling like an alien as I saw the crowds of Chinese daytrippers posing for selfies with their Gucci bags and squeaky clean trekking poles. The last few metres involved splashing though a swampy stream before I could climb up onto the walkway next to a "Keep off the Grass" sign and sit amid the tourists. I took a last swig of my iodine-sterilised brown water that I had obtained from the stream below the pass and looked around me. I suddenly realised how bedraggled and smelly I was compared to the 'civilians' who mingled around me and eyed me suspiciously. My raincoat was soaked and filthy. My boots were caked in grey slimy mud and my hair, unwashed for a week, was matted and greasy. I smelled of a mixture of firesmoke, yak butter, BO and sweat. All of a sudden I felt exhausted and just wanted to go straight back to the hotel. I didn't feel like I had the energy for the hour-long walk down to the monastery and beyond to the shuttle bus pickup point at the roadhead. 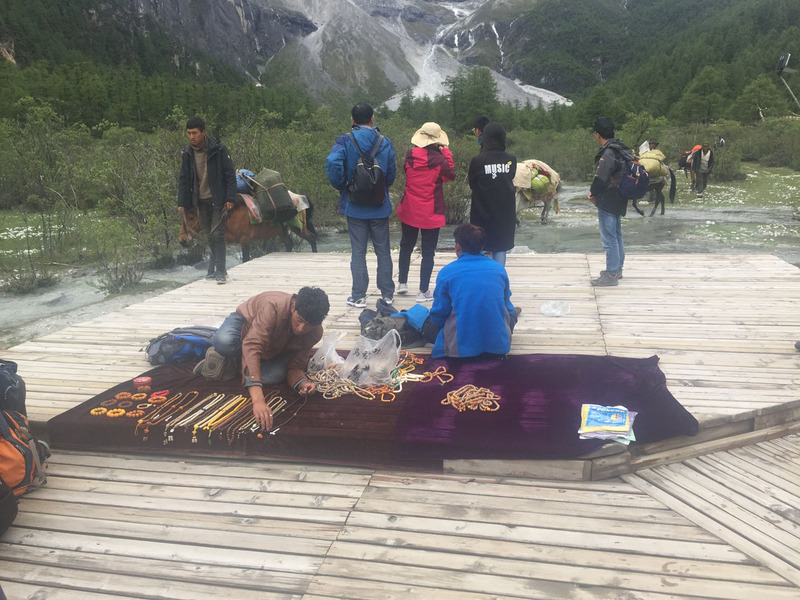 However within minutes our mule train arrived and it was a spectacle of splashing hooves and weary walkers that captured the attention of the tourist crowds - and the annoyed complaints of the trinket sellers, whose displays we spoiled. Cameras clicked and questions were fired at us as the mules were led alongside the boardwalk. Where had we come from? What had we been doing? I dragged myself off the wooden bench and plodded along the wooden boardwalk, resting my trekking pole over my shoulders. We felt like an army returning from battle as all eyes were on us. Back down to the monastery we went, and on the path down to the roadway. Some Chinese visitors now seemed ridiculously equipped to my eyes - wearing silly plastic overshoes and carrying aerosol cans of oxygen. When we reached the roadhead it finally sunk in that we had done it - and this was the end. We shook hands and congratulated each other - and then helped the Tibetan porters unsaddle the packs from the mules and prepare to board the bus. All I could think of now was a hot shower, clean clothes and most of all, food. After a week of eating dehydrated meals, cheese and crackers, I had started having food dreams. I would fantasise about having a bacon sandwich, a steak pie and chips or a proper British curry. I wasn't likely to get any of these things in tiny Yading village - and we had to wait until we drove the hour-long route back to Riwa to get anything to eat at all. All I could do in Yading was hobble up the road to the shop and buy a bottle of orange juice - the first liquid I'd had for a week that didn't contain iodine. It tasted fantastic. On the road outside was a young American couple in hiking gear. They nodded to me and the guy asked me something that I couldn't understand. I paused for a second, feeling dumb. What did he just say? Then I realised he was using English words but I had been speaking Chinese continually for seven days and I wasn't processing these English words properly. I had started thinking in Chinese and my exhausted, oxygen-starved brain was trying to translate the English words into Chinese. There was a pause of about three seconds - it felt more like three minutes - while my brain 'rebooted' back into English mode. You could almost hear the Apple startup sound as I suddenly came back online ... my kora was over and I was back in the real world. Yes there's an obvious track from the huts going down towards Galuo. The kora track branches off right from this after a short distance - it seemed fairly clear to us and we were walking in heavy mist. It's a bit confusing because I expected the kora track to go straight down to the river/stream but instead it seemed to go parallel to the Galuo track for a while then gradually curve to the right. It was further than I expected to the bridge and the track was quite a mess of mud, rocks and flowing water! Well I finally got my Yading trip report posted. Got sidetracked on other work but recently was fun kind of re-experiencing the trek when going through my photos, video and editing my write-up. Anyway, give it a read when you get a chance! I also embedded a 14 min. video at the end which covers a lot of my week-long trek.